CMV promoter replaced with pCMV-D2i promoter. 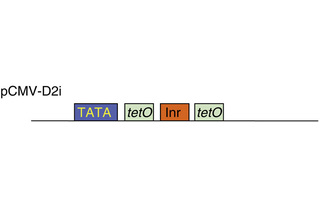 Rabbit β-globin intron and TetR replaced with new Rabbit β-globin intron-TetR::NLS-WPRE fragment. Fragment containing humanized htetR gene from pTet-OFF Advanced plasmid (Clontech). Fragment containing WPRE from plasmid pLVX-DD-tdTomato (Clontech). Modified CMV-based synthetic promoter pCMV-D2i synthesized de novo (Bio Basic Inc., Markham, Ontario, Canada).